Fall is probably my favorite season here in Driggs, but it's also the time of year I travel far beyond the valley for R.U. Outside tradeshows. It's tough leaving the Teton Valley views behind, but I do enjoy seeing longtime friends, associates and customers at the shows. Everything is a tradeoff. So, it's been a whirlwind month, but I'm finally back home for a while and looking forward to getting my bearings again. Here's a quick recap of the past few weeks. First stop was Seattle, with Mt. 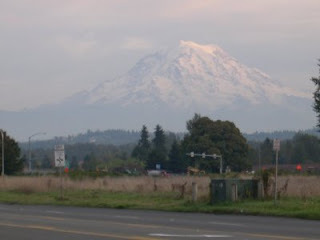 Rainier standing watch. To me, it's even more of a landmark than the Space Needle...it's just an incredibly huge mountain, and I was fortunate to view it briefly after the rain clouds lifted my last evening. Someday I will climb it. 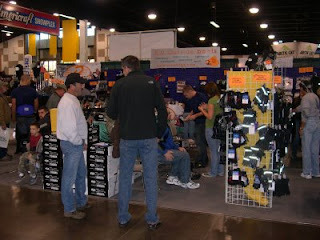 The Washington State Snowmobile Show takes place at the Western Washington Fairgrounds, in Puyallup (just east of Tacoma). R.U. 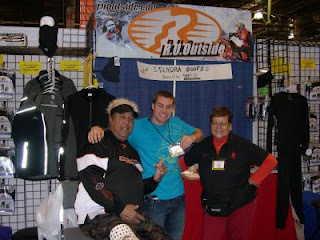 Outside has been attending the show since 1992, so we've got lots of longtime, dedicated, awesome customers there. Washington is also the home of our own wonderful Kay Lloyd (a.k.a. "K-Dog"), whose daughter Jana, grandson Anthony and granddaugher Jenelle now work that show for us as well. It's incredible to have three generations of a great family representing my business, I am honored. I also want to give a shout-out to Kyle and Natalie for driving the truck & trailer all the way from Logan & back, and selling like pros at the show. 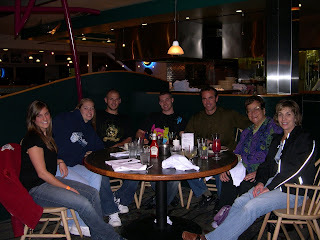 We enjoyed a nice dinner at Anthony's on the water in Tacoma that Saturday evening, celebrating our friendship and a good show day. It was a nice upscale change from the P.O.S. motel we got stuck in for the weekend. Regardless, the "kids" kept me on my feet all night, and I even learned how to follow directions from a Tom-Tom (which is something we don't need much around Driggs). The Hyundai Sonata rental car wanted to go fast, plus the XM sound system rocked...so we missed a few turns but had some great laughs. What is it with me and driving around Seattle? Must be the 3 million other drivers bringing out my running back instincts. Next up was Salt Lake City, my old stomping grounds and just down the road from our Logan store & warehouse. 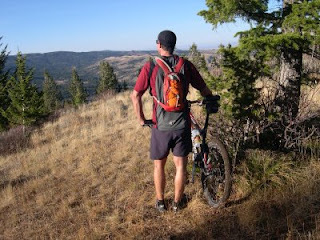 Joanne accompanied me, and it was so warm we brought the mountain bikes along, too. It's nice having a couple of shows within driving distance for everyone, and also near family & friends. Speaking of which, my lifelong buddy Matt Z and his wife Kirsten stopped by the show to say hello, and pose for my one SLC show photo (hey Matt, your wife is beautiful, smile!). Thanks, guys. Rachel was terrific as usual coordinating the show, plus working it along with her husband Drew and Stacey & Brent from Logan. It's so nice having good people around. After a few days home, I was on a plane to Detroit for the Novi, MI show. It's probably the biggest show we do, and held steady in spite of the awful Michigan economy and the fact that it started on Halloween (Let me just say that Halloween in Detroit is a little different than Halloween in Driggs, Idaho. "We're not in Kansas anymore, Toto"). Overall, after doing these shows in the same cities for 15+ years, staying in the same hotels, eating at the same restaurants, seeing the same people...it's almost like a part of me never leaves. Jimmy drove over from Minnesota to help out, which was cool. Kay, Anthony & Jana rounded out the team, and we had a good time. I managed one fleeting photo, with Jimmy sporting his Halloween hairdo and Anthony showing why the Yamaha girls didn't want him to leave (ahh, to be 20 again). Kay held it all together for us. I eventually made it home, flying into Jackson just ahead of a projected three days of snow. 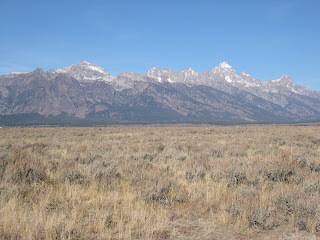 The Tetons will be covered in white the next time I photograph them. R.U. Ready? Awww. Kay Dog. What fun. I see Jimmy at least once a year. Usually at Duluth. I'll be there again this year. It's always fun to see the RU Outside booth packed and busy at the race. The 'wives' always sit just down the room from the booth and I feel like I'm home when I see those purple table cloths and awesome boots! I miss it! Hey Alicia: wanna work a little at Duluth this year? Would love to plug you back in (just part of each day even)...let me know! 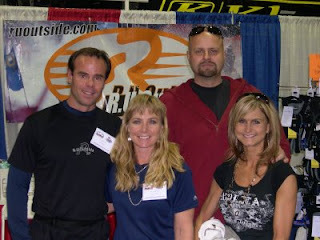 :-) Best of luck settling in for the winter in MN, and "howdy" to Garth for me.